2010 was a loud year for the environment. High profile projects—from Vedanta to Posco and Navi Mumbai airport to Lavasa—hit the headlines for non-compliance with environmental regulations. While 2009 was the 25th anniversary of the Bhopal gas tragedy, it was only last year that we were all outraged by the disaster. The realisation of how every institution—the judiciary, parliament and government— had miserably failed to provide justice to the victims shocked us deeply. It was also in 2010 that allegations of “rigging” of climate change science took the world by storm. The sceptics had their moment of glory as they ridiculed science and picked holes in its analysis. And even though most of what they had to say was proven wrong, the damage has been done. Even as extreme weather has hit parts of the world, we are not certain anymore if this variation is the growing impact of climate change. Then in December at the meeting in Cancun, the world took the final step to deny the problem of climate change. It agreed to do nothing to reduce its emissions at the scale and pace needed. The question is what is the cacophony adding up to. Where is it leading us? Take the issue of projects that have been cancelled or held up because of environmental reasons. It would not be wrong to say that virtually all infrastructure and industrial projects—from mining to thermal and hydel and nuclear power to cement or steel—are under attack today from communities who fear loss of livelihoods. These communities are at the forefront of India’s environmental movement. They are its warriors. For them the environment is not a matter of luxury; it is not about fixing the problems of growth, but of survival. It is fixing growth itself. They know that when the land is mined and trees are cut, their water source dries up or they lose grazing and agricultural land. They know they are poor. And they are saying, loudly and as clearly as they can, that what others call development will only make them poorer. This is what I call environmentalism of the poor. The fact is today development projects take local resources— minerals, water or land—but cannot provide employment to replace the livelihoods of all those they displace. It is for this reason that the country is resonating with cries of people who are fighting development itself. Where do we go from here? I would argue we need to listen to these voices, not dismiss or stifle them in the name of anti-growth dissent or Naxalism. This can be done by strengthening the processes of democracy that ensure people have a say in development. For instance, the Forest Rights Act demands that the gram sabha (village assembly) in tribal areas must give its written consent to a project before it is cleared. Public hearings held during the environmental impact assessment provide the platform for people to voice their concerns. In most cases today the effort is to rig and undermine these processes. Public hearings and even video recordings of the events are faked or the public is kept out through use of force. But what is worse is that the final project clearance process does not demand that these voices are not just heard but heeded too. In most cases one will find the concern raised by people is brushed aside as projects are rammed through in the name of industrial development. This must stop. There is no doubt we need industrial and infrastructure projects, but these cannot be built against the will of people. We will have to reinvent the way we work with people and we will have to reinvent the way to development. We will have to do more with less. Frugality and innovation will have to be our way to growth. Our challenge is to provide the gains of development to vast numbers of people. This requires inventing growth that is both affordable and sustainable. But what all this adds up to, in my view, is to define a new chapter of environmentalism in the world. I say this because it is only now that we are being forced to confront some tough questions on how to be or not to be an environmentalist. We are learning that techno-fix solutions, of cleaning up pollution even as we continue to emit more, are not good enough. 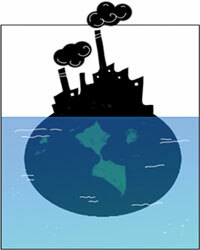 The rich world has failed to reduce its greenhouse gas emissions through its investment in efficiency. It now needs to find ways to reinvent growth without fossil fuels and to grow within limits. The world failed us in Cancun because the rich are still not prepared to accept the writing on the wall: there are limits to growth, unless we can grow differently. We in urban and middle-class India must learn this lesson quickly. We cannot afford this environmentalism of costly solutions that want to put band-aids on what is so badly broken. We must understand that our future lies in being part of the environmentalism of the poor, as this movement will force us to seek new answers to old problems. The bottom line is that in this New Year we must embrace a new philosophy: unless we rock the boat we will not have a boat at all. This is a very well written editorial.It is very well understood as well.Yes we require environmental activism that is inclusive as much the projects which do not displace the natives and basically their culture .Because that is our heritage.We are poor and the poor have only their culture to cling to and if this is eliminated then we wont have farm labourers and factory workers but only consumers.Then we can have all the goods in the mall but a very maladjusted lifestyle which will equate health with 5 star Hospitals and food with 5 star restaurants. Jaitapur is a case in point.Maharashtra is always the sucker .why because we want our primeminister or some of us have political ambitions which are being used to bait the people of jaitapur.and if pritviraj cannot deliver jitapur lock stock barrel to the centre he is out! Can we trample rights for a promise which will not be kept.can we desecrate a culture rich in tradition. land aquisition is a process of commerce and untill each of jaitapur farmer becomes rich transparently why should he appoint the middlemen to trade off his land. we just celebrated 250th aniversary of Panipat where we lost 70,000 marathas in the 3rd war against Afgans for the sake of delhi.jaitapur will be the war of environment versus cheaters where cheaters are the mongers of progress and the konkanastha saraswat will be defenders of the heritage of the soil.lets all enjoy this war of wits .and when the likes of sunita or Magha or arundhati are around it is bound to be a fair one . Never mind who looses or wins for as we know there are no winners or loosers there are only consequnces!! I request Sunithji to this Editorial outline forward in a pro-active way. We need to quickly list out some big projects (eg. Hyderabad metro rail) that are being pushed in the name of development and modernity, and without subjecting them to any public debate and environmental scrutiny whatsoever. The year 2011 should herald a new chapter in this regard. People like Ms. Sunita Narain, who have the intellectual ability, resources, reach and stature should take lead in this direction. Time is running out. Thanks for an outstanding essay. I am going to assign it as reading for the first week of my undergraduate class in Environmental Policy and Politics. The issue is here of greed and a lifestyle which we have got used to,which involves driving cars or using transport(which involves use of steel),houses(involving use of cement,sand),communications(involving use of plastics,copper,etc) and so many things which necessarily involve minerals and therefore mining in some form or the other. We all want success,and to be successful means either high salaries/income or high positions and we are driven towards a 'successful','progressive' lifestyle which necessarily involves usage of goods 'suitable'for that lifestyle,which involves consumption of the above mentioned objects. The road toward an economy of qualitative growth, beyond quantitative growth fetish, was made by hundreds of indigenous societies. and . The point is to change the world of developmentality. It is good to be a leader with great ideas and vision but the question arises can we do without the foreign aid and world bank help for marching forward. Cancun showed the real face of all such projects and the ground reality. It is the same again that the rich and mighty people will reign supreme always without any regards for the sane and sensible development /governance. Hence something concrete has to bethought so as to be able to have a say while still being small. . It is a far cry. With this scenario in mind it is great of Barak Obama to have reached the pinnacle despite being black and in minority. Therefore we have to think and think hard before we can make our voice to be counted. Taking the Jaitapur nuke power case, a newspaper like Times of India has today made out that the fears of nuclear power expressed by local protestors is due to superstition. The ill-effects of radiation are known world-wide as impotency, birth deformities and cancer, among other lesser evils. But the corporate lobby (which includes the NPCIL) spreads lies and half-truths and this is done through corporate media, to pooh-pooh the objections of protestors. The editorial is excellent, calling for a change of approach towards what is called environmentalism. The corporate world (which influences governments hugely in more ways than one) needs to understand the limits of growth and the finiteness of the environment as a source of resources and as a sink for industrial effluents and discharges. well written. And as earlier pointed out by Mr Ramachandriah, projects like the metro in Hyderabad are disastrous and Ms. Narain can spearhead these movements. A very well worded editorial.Thanks for putting all these perspectives together so neatly. Four Heads of State have come and gone in 2010. What have they gone back with? Billions of dollars of commitment and contracts from the Defence Ministry. A firm commitment of a minimum of 250bn dollars till 2020 for defence equipment. The western world is loosing sheen on its absolute advantage. Their equipment and machinery are getting out-dated. The only thing that they can supply is defence equiment. India is one of the biggest contributor of Carbon Credits, after China. Asia is the biggest contributor of Carbon Credits @51%. What we probably need, is to check on the quality of Infrastructure machinery and equipment that we Import from the West. Do they conform to Environment Standards, or are we blind to what they supply. The metro, mono-rail, road contracts are awarded against Global tender. But none of us ask the question as to why the Structural Consultants and Architectural Consultants are not appointed through Global Tender? These consultants are appointed by the Government and the politicians. For example: In Karnataka, Stupp Consultants is the only agency which designs the fly-overs, bridges etc. The quality of their work has always been suspect. A very balanced statement about the problem with environmentalism. The long term solution is, as mentioned in the article, " It now needs to find ways to reinvent growth without fossil fuels and to grow within limits." Solar Energy provides the answer, and the soution to our predicament. Harnessing the Sun will come much faster than what we anticipate, and by the time we really face the 2C rise, solar energy also would have taken roots and become the predominant form of energy. The other key factor is "Growth within Limits." Here the growth of population is most important, and if we can limit that, we shall have a 22nd century that turns the corner for mankind and sets it on the road to prosperity. The editorial is interesting and raises very pertinent questions. However, the editorial has missed one point completely. During last several decades projects were given clearances by the Ministry of Environment & Forests and its associate organizations by adopting wrong methods or by suppressing the facts. Obviously, it was done for certain reasons either as political favour or for other considerations. People of the country have the right to know what actions are being taken against those who were involved in those wrong approvals. Otherwise once the dust settles those who are at the helm of the affairs in the Minsitry or in other organizations will again revert back to the same tactics of favouring project proponents for political reasons or personal considerations. Obviously, voice of the poor who suffer on account of those favours will not be heard. As the editorial points out, there is a need for new and innovative partnerships between and within communities to ensure sustainable management of resources. All of us must recognise that we are part of a larger commons be it water, land, forests or air and participate in the development and maintenance of relationships that will allow these resources to be used responsibly. 'Institutional Monoculture' (a term used eloquently by Jairam Ramesh in a recent keynote address) must be replaced with local and situation specific governance models. What a good and powerful editorial! It's so clear that our global leaders are competely bereft of ideas and initiative. At a fundamental bio-physical level, they don't understand what is happening. Humanity is now entering a very bleak era. Like these, on earth I wait forlorn." The forces of development/profit - which are either unaware about the environmental impact or 'could'nt care less' types or deliberate exploiters of nature - will be inexorably there. On the other side the people who are either directly affected ,like oustees, or those who have seen the harmful effects and care about it - what can they do. In your editorial you have mentioned about effective innovation to do things differently . Next,some or all of these savings (and even donations)are channelled thru' and for this community to acquire land - little by little. Then in these tracts alternatives which sustain both man and nature (I know man is included in nature - but how immediately conscious are we of it)can surely be pursued more effectively in this 'private' land. If a Lavassa can happen ,why not the above possibility? This article leaves me with a query wether is SUSTAINABLE DEVELOPMENT an ANTI DEVELOPMENT Concept atleast for a country like INDIA ???? As discussed in the article, in the whole Climate Change debate it is all about the Rich denying their share of responsibilities & in this whole blame game we completely forget to consider the historical emissions which they have made and the resultant of which is the scenario we face today. Be it Sardar Sarovar dam or be it Jaitapur Nuclear Plant Project, the Development is at the paramount of all. Then where does this whole concept of democracy come into picture? Why is that the needs & demands of the poor are always a secondary priority? This is why our government needs to be sensitive towards the issues & concerns of the POOR or the stakeholders per se as ,the lesser is the community involvement in the developmental projects, the greater is the content of dissatisfaction between the communities at stake & at benefits. If this is taken into consideration then the benefits of development can be equally shared & enjoyed. Thanks for sharing this great issues.. Thank you very much for the acknowledgement. Environmentalism should not be tackled as an obstacle to industrialisation. For developing countries, environmentalism should be the forefront of progress. Sustainable development should be the most important factor when making decisions about progress. Western countries are already too late when it comes to reversing the damage done to the environment, but developing countries still have a chance. I think these industrial projects cannot only take into consideration the environmental effects. They also have to take into account the possible loss of culture or ecology of the area, and the loss of employment of people who were already living there.